Whenever there is a noteworthy Chinese festival we can’t help but introduce it and get you to join in on the celebrations and to learn more about Chinese language and culture! One such holiday is the ‘Middle Autumn Festival’, or in Chinese ‘中秋节’ (Zhōngqiū jié). This festival can also be called the ‘mooncake festival’ but we’ll get back to that later. Mid-Autumn festival is not just celebrated in China but also across other Asian countries, and it’s always celebrated on the 8th month of the lunar calendar. This year it falls on a Monday, September the 24th, and we are all excited as we get a holiday to celebrate it with our families. The Mid-Autumn festival is the second most important festival in China, can you think what is the first? Of course, it’s Spring Festival! 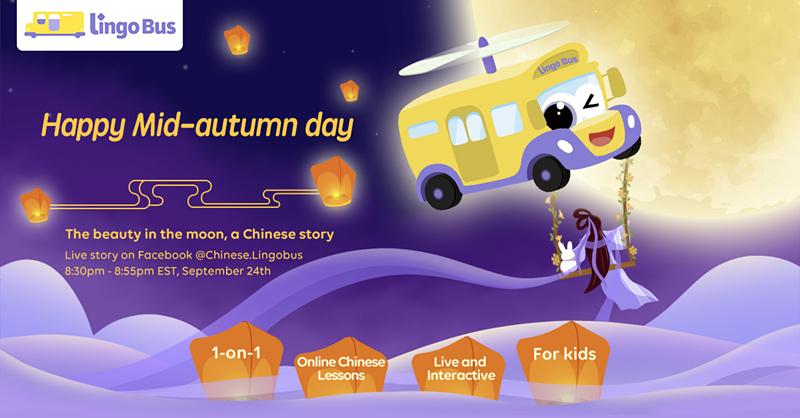 At Lingo Bus, we are going to present you a fun online class on 24th from 8:30 to 8:55 pm, EST! Our buddy panda Benben will take a tour to the moon! What will they find?! Come and join us for a fun night on Lingo Bus Facebook page @LingobusChinese and @LingoBus.Chinese, or on our official Weibo account! So why is it celebrated? The Mid-Autumn festival has been celebrated for over 3,000 years, and is always celebrated when the moon is believed to be at it’s biggest and fullest. It’s a truly stunning sight to behold, the nights are getting cooler so it’s comfortable to sit outside looking up at the full moon. In China, like most festivals, the iconic thing about this festival is rooted in family reunions. Learn how to teach children Chinese culture of zodiac now! Its tale starts in the Shang Dynasty when the moon was worshiped for a good harvest as during that time people believed the sun and the moon were gods. 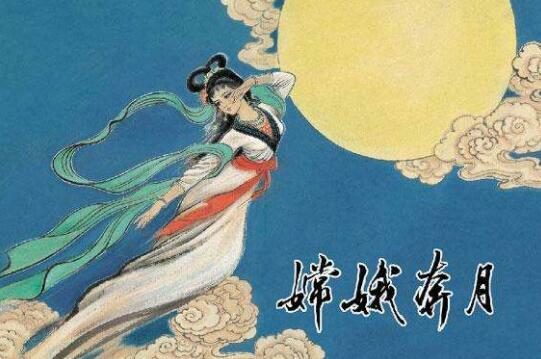 As most Chinese festivals, the Mid-Autumn Festival also has some famous tales, my favorite involves a love story. A longggggg longgggg time ago… okay I’ll skip this part! Once there were ten suns in the sky, as you can imagine this caused a lot of problems, the extreme heat started to burn all the plants and animals on earth. That is until our hero shows up, Hou Yi! 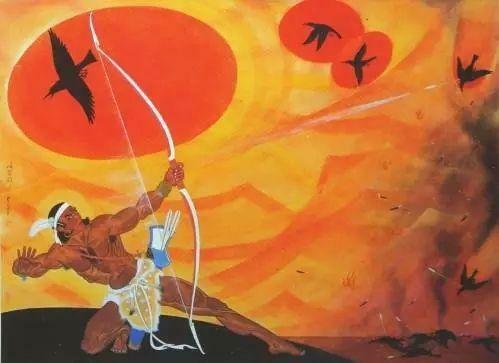 Young Hou yi was the most amazing archer you could have ever seen, to save the earth he shot down 9 of the suns. As a gift the great queen mother gave him an elixir should he choose to become immortal. However, our young hero was deeply in love with his wife and choose to give up immortality, hiding the elixir in his house. Having heard of his immortality gift, some thought this was something worthy of stealing. One such person was one of his archery students Peng Meng who was jealous and wanted it for himself. He decided he would go into Hou Yi’s house when he’s away and steal the elixir, however he didn’t count on being met with Hou Yi’s wife, Chang’e. When Chang’e met with the robber she refused to give him the elixir, instead drinking it herself. As she did she became immortal and flew into the sky. The two lovers were now separated much to their sadness. Chang’e wanted to stay nearby so she chose the moon as her residence so she could forever watch her husband even if they could not meet. When he found out, Hou Yi decided that his wife’s bravery should be celebrated so that she won’t be forgotten. He offered the moon many gifts and started worshipping it. Other’s who felt saddened by what had happened decided to do the same. And so, that is the story of the Mid-Autumn Festival! But don’t feel sad, the Mid-Autumn Festival is a time for gathering, reunion, and celebration. Families come together when Hou Yi’s couldn’t. So how is the Mid-Autumn Festival celebrated? Well there are a few ways, apart from meeting up with and having a meal with your family or worshipping and looking up at the moon, here’s how the Mid-Autumn Festival is celebrated. Well, food! During the Mid-Autumn Festival everyone eats mooncakes. 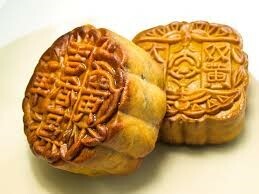 Mooncakes are a traditional Chinese pastry made from wheat flour and a sweet stuffing. Although they aren’t very healthy they are so tasty! They are shaped round like the moon and may have a print. In the weeks leading up to the Mid-Autumn Festival you will find packages of them for sale in bakeries, shops, and coffee shops. 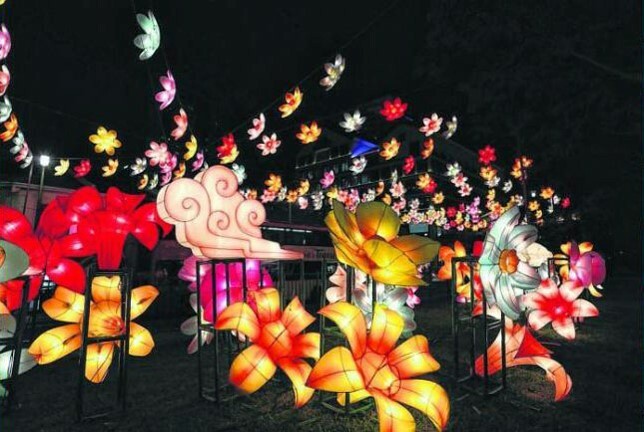 Not to be confused with the lantern festival. 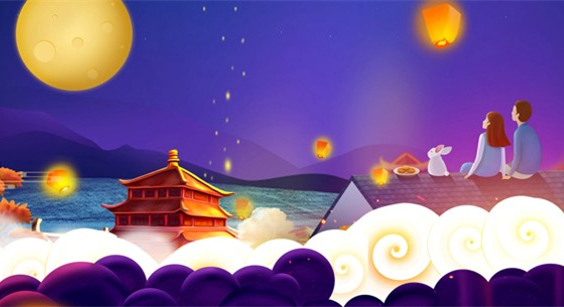 During the Mid-Autumn Festival children will create colorful lanterns and write their wishes in them. The lanterns are then allowed to float up to the sky in the hopes of reaching Chang’e so that she may grant you your wish. A festival with such a heartbreaking love story encourages lovers. During this festival many townships will have matchmaking games and parties. Single women are also encouraged to pray to Chang’e to find them a good match. So now you know how to celebrate the Mid-Autumn Festival!